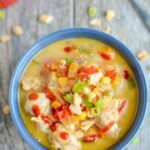 This Instant Pot Thai Peanut Chicken Soup recipe is dairy-free and packed with summer vegetables. Perfect for a healthy lunch or dinner in under 30 minutes. You guys didn’t think I forgot about my Instant Pot did you? Don’t have one yet? Snag one here! (affiliate link) As you know, I bought mine back in November and have continued to use it pretty much every single week since then. This most recent creation was an experiment that turned out SO well. It was loosely inspired by my Salmon Corn Chowder. For some reason, I crave chowder in the summer. 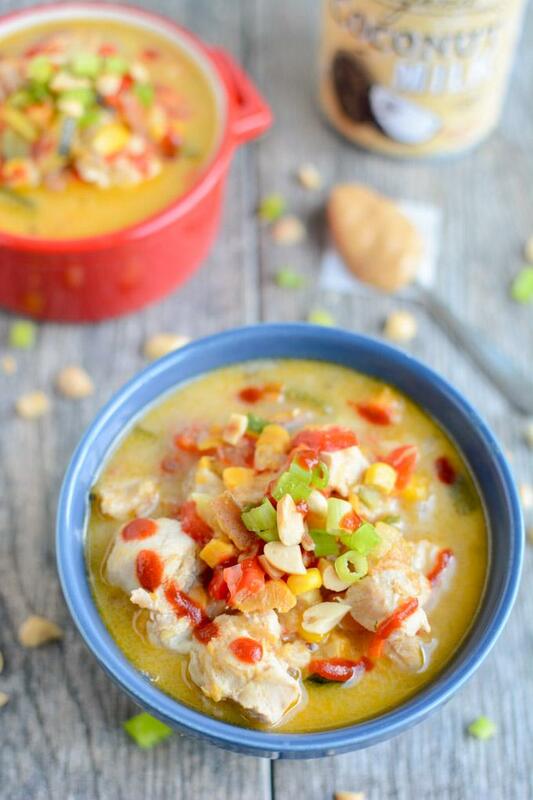 I think it’s because I grew up eating this Easy Fish Chowder at my aunt’s house every summer. However, although I’m not completely dairy-free, I have continued to minimize my intake while nursing Little Miss…so my two go-to chowders were out of the running this summer. 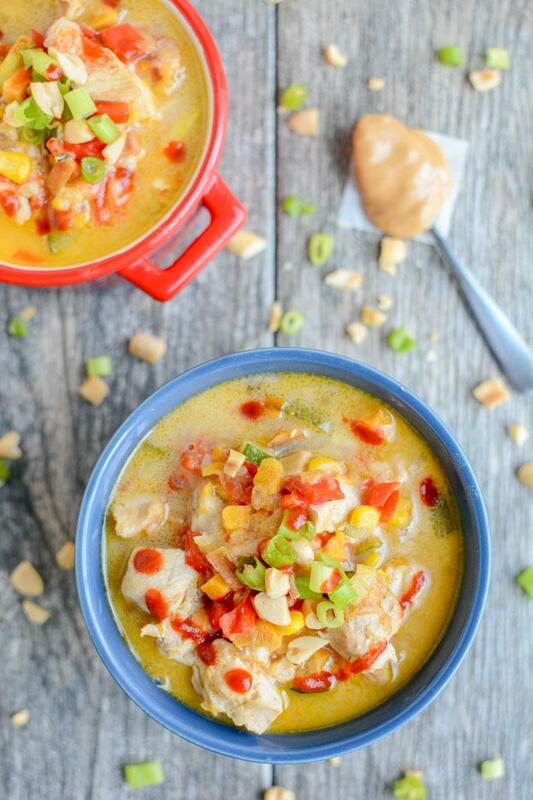 Instead, I grabbed a can of coconut milk from the pantry and took a risk combining some summer veggies like yellow squash, zucchini, peppers and corn with a non-traditional soup ingredient – peanut butter! The end result was epically delicious – if you like coconut. The flavor of the coconut milk definitely shines through and it’s balanced well by the peanut butter. Then add a healthy squirt of sriracha and you’ve got yourself a spicy bowl of goodness! Plus it’s fast. A few minutes of chopping veggies and chicken, a few minutes for the instant pot to heat up and 10 minutes under pressure and boom! Turn the Instant Pot to Saute. Add bacon and onion and saute for about 3 minutes. Turn Instant Pot off. Add all remaining ingredients except coconut milk and peanut butter and stir to combine. Use manual mode and set Instant Pot for 10 minutes. Use quick release, remove cover and add coconut milk and peanut butte. Stir to combine. Think you can handle it? I leave the sriracha out to let everyone add their own, but if everyone you’re making it for likes it spicy, feel free to add it in! The spicy kick is definitely what takes it to the next level. I am obsessed with my instant pot!!!! Despite not being a huge fan of soup I think I can get behind anything with peanuts! i love peanut flavors in savory dishes..and will definitely be trying this out. Made this tonight…. SOOOOO good. Even my kids ate it up 🙂 Only changes I made – added a few thai chilis for heat and a few splashes of fish sauce. The crunchy peanuts on top gave it a nice texture contrast. Thanks for sharing! It looks so fresh. I usually only eat gazpacho during Summer but this Thai soup seems a good alternative, quick and healthy. Super excited to make this! Did it hold up well being reheated for leftovers? Do you think you could freeze it as well? TIA! i liked it as leftovers. I would assume you could freeze it but haven’t tried! So delicious!! I didn’t have squash or zucchini but it turned out super yummy! I added green onions and sriracha to the top! I can verify this is a truly delicious recipe! Only second time using my Instapot and it was a breeze. I served mine over brown rice, almost like a curry. For manual setting on instapot, use “high”. Used all natural peanut butter (not the super sweet JIF kind) and it made for a subtler flavor. Would make again- thanks Lindsay!